Aquaman and The Fisherman? But wait... isn't he dead? 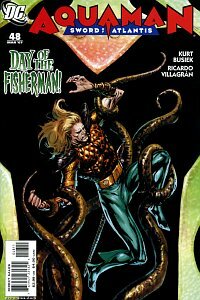 Also, JLA: Classified continues the storyline that involves Aquaman as a decoy who isn't happy with the actions of the League. If you spotted something I didn't mention or have any comments, use the comments link on the post to let me know.